This post originally appeared on Minxeats.com on July 16, 2013. Regular readers of Minxeats know that I'm a pretty adventurous eater. I also come from a Polish immigrant family who valued what we now like to call "nose-to-tail" eating. My Mom used to rhapsodize about a dish my Grandma prepared long ago called chłódno nogi, or cold jellied pig's feet. 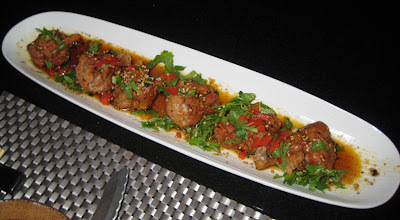 While the "jellied" part of the equation never turned me on, I was curious to try pig's feet. I've been a fan of crispy pork skin and collagen- and calcium-rich cartilaginous goodness practically since birth. 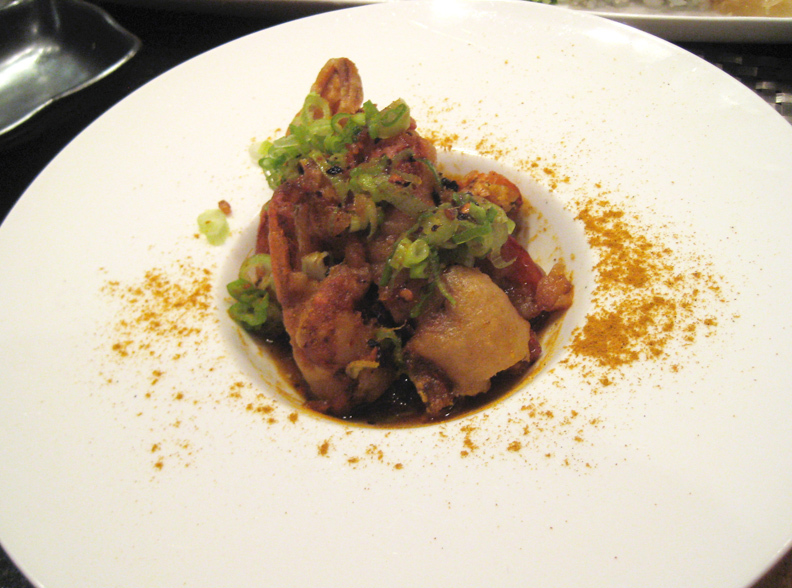 And lucky me, there's a restaurant in New York that specializes in that very thing - Hakata Tonton. When I was in New York for the Fancy Food Show earlier in the month, I met up with my regular NY dining companion, David, for dinner. Hakata Tonton is conveniently close to his place of employment and seemed like the obvious choice. For me, at least. Thankfully, David trusts my judgement and is willing to eat adventurously. The menu at Hakata Tonton is fairly voluminous for such a tiny place. When we were asked if we had a reservation - on a Monday night - I at first thought the restaurant was pretentious. But then when we got inside, I saw that there were only about eight tables, plus six seats at the bar, and all were full. They squeezed us in and made us feel very welcome. After hemming and hawing over what to order - and I wanted most of it - I narrowed my choices down to three: soft shelled crab, a sushi roll, and tonsoku, aka pig's feet. Because one can't not eat the specialty of the house. My dishes came out in rapid succession, first the crab, which was lightly battered and served atop a delicious ponzu sauce of sweetened dashi and the aromatic Japanese citrus known as yuzu. Then came a simple maki roll with lettuce and fried shrimp. 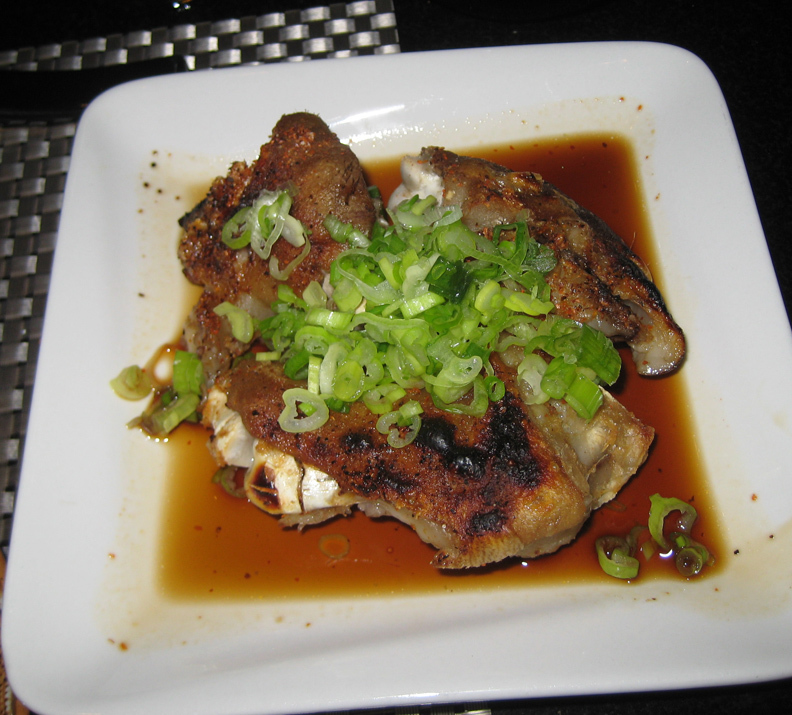 And finally, the main attraction - three hunks of grilled pig trotter with scallions and more ponzu. The skin was crunchy/crispy, the little meat on the bones was gelatinous, and overall it was finger-licking-good. 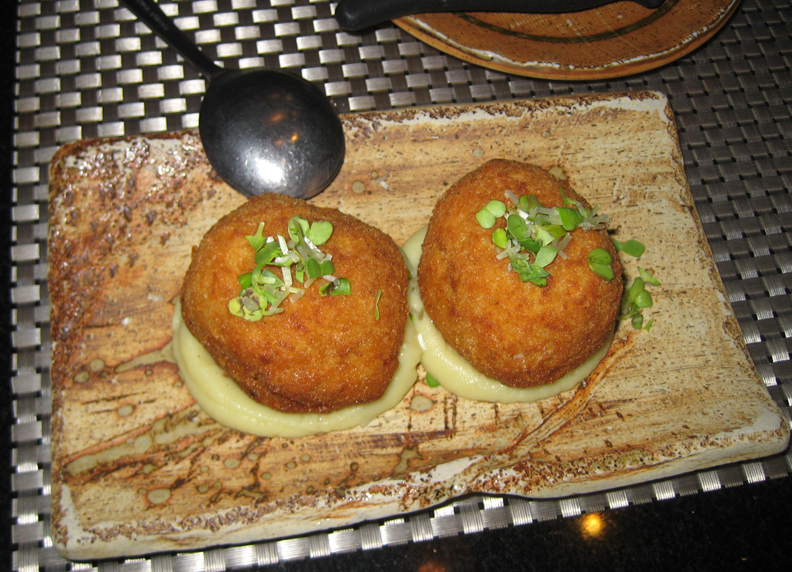 David went for the snow crab croquettes, which had bits of tonsoku inside and sat atop a sweet-ish puree of Japanese sweet potatoes. 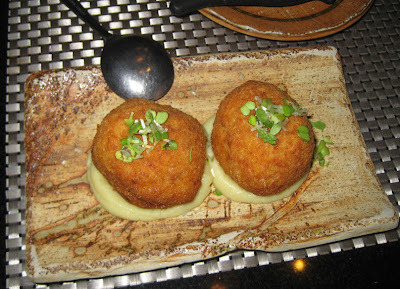 The croquettes were very soft under the crisp crust, hence the spoon. The flavors were very mild and I wished there had been more actual crab inside. After quite a wait, David's deep fried chicken showed up. Each of the six blobs of meat were about the equivalent of a de-boned chicken leg. The meat was juicy and perfectly cooked, and the crust was delightfully crunchy. And of course there was more of that lovely ponzu sauce on the plate. Really excellent fried chicken. We both enjoyed our meal, and I wished that we had been a bigger party with bigger appetites so we could try more things from the menu. Several diners around us were eating hot pots filled with tofu, dumplings, vegetables, Berkshire pork belly, and tonsoku, and it smelled outstanding. I would have liked to try the ankimo (monkfish liver) in yuzu miso, the slow cooked pork buns with spicy mustard, the collagen soup gyoza, scallop fritters, and the okonomiyaki. And...maybe next time.